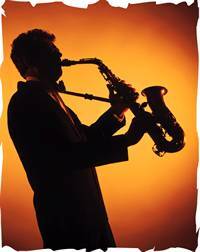 Jazz-Trio.com is your first point of call for all your live music requirements, not just for a jazz trio, in fact not even just for jazz. We provide live music of all descriptions throughout the UK and across the world. Harpist for your ceremony; jazz trio for the champagne reception; string quartet during the wedding breakfast; '70s dance band for your evening entertainment; we can supply all of this and more. Jazz band; Rat-Pack style swing band; '20s dance band; soul band; funk band; '70s disco band; jazz trio playing unobtrusive background music whilst your clients mingle and chat, or party band for dancing to celebrate the end of a sucessful conference. Recent corporate clients include Cameron Mackintosh Ltd, London Borough of Tower Hamlets, Oracle and 3 Mobile Phones. Looking to Hire a Jazz Band? Jazz in all sizes and flavours: solo piano or solo guitar; pianist/vocalist (male or female); jazz duo; jazz trio; jazz quartet; jazz trio or quartet with vocals upwards to a full big band, with or without vocals. BandWagon can provide you with a wide range of live music, from solo musician, jazz duo or jazz trio, right up to a swinging big band or funky function band complete with 4-piece horn section. All of our musicians are of the highest professional calibre, with the wealth of experience that comes from playing at the world's top venues to some of the world's most important people, from royalty to celebrities. We specialise in providing a jazz trio for unobtrusive background music during cocktails or dinner, and, if required, adding more musicians later on to build the party up for dancing. BandWagon is perfect for weddings, celebrations, corporate events or just a party! Recent successes include events at Blenheim Palace, Brocket Hall, Claridges, Cliveden, The Dorchester, ExCel, Great Eastern Hotel, The Hempel, ICC, Grosvenor House Hotel, London Hilton Park Lane, Honourable Artillery Company, The Houses of Parliament, The Hurlingham Club, InterContinental London, Mandarin Oriental Hyde Park, Monte Carlo Sporting Club, One Whitehall Place, Room on the River, Royal Aeronautical Society, The Waldorf and The Waterside Inn, not to mention many other hotels, private houses and marquees across the country. Please browse through the site using the menu to the left. There are music clips to listen to; please be patient whilst they download. Please telephone, e-mail, or use the form on the contact page to order a free CD, ask for a quote, or request any further information that you might require.